Critically acclaimed “creepy cute” stealth shooter Kartong – Death by Cardboard! will be launching on April 4th. After an Early Access phase with multiple top spots on the Steam VR global bestseller list, the studio now has even bigger plans for the game. Kartong – Death By Cardboard! will feature a non-VR-mode, making it the studio’s first PC release! 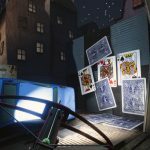 “Our motto at SVRVIVE Studios has always been ‘Immersive first’, but with Kartong – Death By Cardboard! we had such fantastic player response during Early Access that we decided to invite non-VR gamers along for the full release. We’re excited to announce that the game now can be played both as a PC game and in its original VR mode ”, says Nils von Heijne, Creative Director at SVRVIVE Studios. Kartong – Death by Cardboard! puts you up against wicked experiments inside the miniature city of Kartong. An oddly charming YouTuber has shrunken you down to the size of a guinea pig and trapped you in his self-built cardboard maze of evil toys and traps. Your life now depends on mediocre office supply-weapons and your every move is being filmed for his YouTube enjoyment – a truly odd experience, all wrapped up in challenging stealth/FPS gameplay. Both PC and VR modes will offer procedurally generated levels with constantly changing maps, traps, weapons and toy enemies. The many difficulty levels will push you to the limit and the unique seed system allows you to replay favorite maps and share them with friends. For the full release, Kartong also features a new progression-system where the enemies you slay drop special coins to upgrade your crossbow, with a special skin for those who beat the game! With the new gameplay concept Kartong Co-Labs, the studio is also putting your favorite streamers and YouTubers into the deadly cardboard world of Kartong. The custom-made Co-Labs maps will feature different guest events, providing players with a growing library of challenge maps to explore. The various Co-Labs partners will be announced inside the game and on SVRVIVE Studios’ website as they go live. Kartong – Death by Cardboard! is the second title coming out of the Swedish immersive games studio SVRVIVE Studios, following the success and global acclaim for the mystery adventure game SVRVIVE: The Deus Helix.